Following up on Ren’s post last night….After Wednesday night’s terrible performance against the Philadelphia 76ers, I predicted there was no way the Rockets were going to beat the World Champ Celtics. Even though Boston had been struggling of late, I thought the Rockets, even though they had bounced back from poor games before, couldn’t defeat the Celtics on the second night of a back-to-back. Especially since the Rockets had lost 5 games in a row on the road, and 5 of their last 7 games. It looked like it was going to be another loss late in the fourth quarter after several mistakes offensively and defensively gave the Celtics the lead. Ho hum, another collapse for a loss. But they proved me wrong, and I’m ecstatic to say I was wrong. Some young Houston players stepped up big-time. Von Wafer‘s three-pointer from the corner was absolutely clutch. That’s going to do wonders for his career. The guy has GOT to have stones to be such a young player and have that crazy Mohawk haircut of his. 4-of-6 from behind the arc Wednesday night. Love it. I like Von Wafer. Getting put down by the rim is not the way anyone wants to make SportsCenter but recognize the kid has heart. He bounced right back, called for the rock and hit a big three to quell a burgeoning Celtic run. And he’d be back for more in the 4th. Wafer is the only guard on the team with that combination of size, 3-pt shooting and ability to finish… so long as it’s not baseline. More importantly, he plays with that underdog intensity. How does a guy go from what what you could at best call a journeyman to such a solid commodity for the Rockets? A question for another time. Rockets vs. Celtics should have been a battle of conference powerhouses and a potential Championship preview. Instead, both teams limped into the TD Banknorth Garden (which just sounds terrible) as the two most talented slumping teams in the league, both losing 5 of their last 7 and both dropping winnable games to very beatable opponents just last night. There was little on-court swagger. Give it up to Boston though for coming out to support, their energy alone seemed to put the Celts up early as Paul Pierce and Kevin Garnett couldn’t miss blindfolded. Boston converted roughly 65% of their FGs throughout 1st quarter and dropped 31 for the period. for more photos from the game. Good thing for Houston, the Celtic defense didn’t follow the lead, looking about as bad as it had throughout their slump. In fact, neither team locked it down on defense (which has likewise hurt the Rockets during their own slump) even with Ron Artest back in the Rockets lineup. Through 3 quarters, both teams were converting +.500 from the field. What geniuses at the NBA league office in New York scheduled a game as big as the Rockets-Celtics on the same day as election night, one of the biggest nights in the nation over the past 4 years? It turns out I didn’t miss much considering the Rockets lost their first game of the season, and Yao Ming had a crappy night, getting in early foul trouble, and scoring only 8 points on 4-of-14 shooting, which included getting his shot blocked 3 times. On the bright side, he only played 28 minutes (sarcastic tone inflected). I’ll refer you to the Houston Chronicle for the rest of the game story. Here’s a link to Raymond’s photos from the game. I’ve always felt if you’re going to lose a big game, it feels better to lose big. That way you don’t tear yourself up about how one play here or there could have been the difference in the ballgame. A good shellacking can also get you extra motivated to improve your weaknesses. That’s what happened Tuesday night as Boston blew out the Rockets in the third quarter and cruised to a 94-74 victory. The Celtics’ defense was outstanding on Tracy McGrady, who didn’t attack the rack much in this game like he had been doing during the streak. McGrady gave major props after the game to their defense, coached ironically in part by former Rocket assistant coach and defensive stalwart Tom Thibodeau. I was impressed the Celtics decided to play McGrady one-on-one most of the time, with former Rocket (and one of my favorites) James Posey manning up against him far away from the basket. You may remember Posey being instrumental to Miami’s championship run a couple of seasons ago. Regardless, it would have been nice to see McGrady take it strong to the hole and draw some fouls, even if they were going to be hard fouls. Instead, he only took 11 shots (mainly jumpers) and only made 4 of them for 11 points. This game made it clear that Yao Ming and Carl Landry‘s absence in the paint hurts immensely. Carl is out again and won’t play against the Celtics, but it sounds like he’s close to being game ready. Hopefully he’ll play Wednesday night against New Orleans, and that they’ll be gunning for #24 in a row if they get by Boston tonight. Yao Ming elevates over Boston’s Kevin Garnett for a one-handed jam. However, Garnett would get the last laugh as he willed his team to a fourth quarter victory over the surprising Rockets. The Rockets were outclassed in the beginning of their game against the Celtics Wednesday night, falling behind by as much as 20 points as Boston ran a clinic against them, embarrassing the Rockets, who left guys wide open for layups. They also got outclassed at the end of the game, getting beaten by a superstar in Kevin Garnett, who hit big shot after big shot to score 11 points in the game’s final 7 minutes. In between, the Rockets fought hard and made it an interesting game against one of the league’s best teams. But as expected, they didn’t have a guy to step up at the end of a close game, while Boston did. It was just a matter of time before one of the Big 3 (Garnett, Ray Allen, or Paul Pierce) of the Celtics put the Rockets away, and no surprise, it was KG, who hit several jumpers in the fourth quarter to push the Celtics record to an amazing 27-3 after beating Houston 97-91 in Boston. Meanwhile, Houston’s superstar, Yao Ming, didn’t do anything in the clutch moments of the game, partly because he was swarmed by Celtic defenders who made it difficult for him to get the ball, and partly because he hasn’t been that clutch with his shot late in games. He was 1 of 3 from the field in the fourth quarter, scoring a garbage basket at the end of the game. I have said before that it may not be fair for Yao to be considered the prototypical go-to guy since not many back-to-the-basket 7-footers don’t have the luxury of being able to dribble much to create their own shot. It’s also easy to double-team a guy when he’s not facing the basket and is down low in the paint in a confined area, unlike KG who can move around, face up and shoot jumpers over the defense as good as anyone. 4-3-2-1…We will have lift off! I would like to welcome to YaoMania! a friend of mine who has offered to provide some of his thoughts about Yao and the Rockets. His name is Tim T., and here’s his thoughts about Yao’s game against the Celtics last night. Timing. It’s all about timing in this league. Yao Ming, in just his second game back from injuring his knee, doesn’t quite have his timing back yet. 11 points and 5 boards in just 19 minutes, Yao had a sub-par game against the lowly Boston Celtics. In every Yao-fan’s mind, there was some hope that Yao would come back with a bang. The Rockets were doing excellent in his absence, 20-12, and any wishful thinker probably believed Yao’s return would only catapult the currently seeded 5th best team in the West ahead into the top echelon of the NBA. But that will have to take time. Yao gets ready to shoot over Boston’s Michael Olowokandi Wednesday night. Yao finished with 11 points and 5 boards in a blowout victory over Boston, 111-80, to avenge their disappointing loss last week. Click here for photos from the game. I love how the Rockets made a statement and blew out the Celtics 111-80 in Boston after that disheartening loss in Houston 9 days ago. Good job, Rox. Yao scored 11 and grabbed 5 boards, and only 1 turnover. Tracy McGrady scored 25 points on 7-of-16 shooting, but he had 6 TO’s. Overall the Rockets shot 51.3% and made 15-of-28 three-pointers on an amazing 53.6% shooting. Yes, they shot better from behind the arc than inside it. Live by the three, die by the three. Tonight they lived it to the fullest. Meanwhile the Celtics shot 35.9% and were 1-of-9 from three-point land. When Yao scored his first bucket on a strong move in the middle of the paint, and later swatted Delonte West’s layup attempt with authority, the Boston crowd – with a large contingent of Asian-Americans who come to see Yao every year – ooohed and aahhed loudly. Nice to see he still draws his fans when on the road. After the injury, useless Boston announcer Tom Heinsohn said, “That was his chopstick finger, too! He may not be able to eat any more!” Yeah, right. The Rockets crisp passing for open shots was impressive – the best I have seen all year. They finished with heir highest number of assists this season: 31 assists on 40 field goals! They also had 12 steals. Shane Battier was fantastic from behind the arc, hitting 5-of-11 three pointers for 15 points. They were a direct result of great passes for wide open shots. Chuck Hayes played one of his best games as a Rocket, hustling for 11 boards and 14 points on 6-of-10 shooting. Rafer Alston shot well, hitting 5-of-9 shots for 14 points. And Juwan Howard was 6-of-10 for 12 points. Now if the Rockets could just take this game and bottle it for the rest of the season and playoffs, you won’t hear me complain at all, except for stupid remarks by opposing teams’ announcers. Yao adjusts his leg brace before the Rockets played the Celtics Monday night in Houston. Yao didn’t play as he continues his rehabilitation, and it’s easy to see by looking at the brace why Yao and Jeff Van Gundy are concerned about how it could alter the way he runs, creating even more problems down the road. Click here for more photos from Yao’s workout before the game. The brace is just as ugly as how the Rockets played Monday against the Celtics, scoring a season-low 72 points in a loss without T-Mac who was sick with flu-like symptons. I don’t care if Yao or T-Mac didn’t play Monday night, it’s unbelievable how the Rockets lost 77-72 at home to the team with the worst record in the NBA, a team had lost 12 road games in a row, and 22 of their last 23 games. T-Mac had “flu-like symptoms.” If one of those symptoms was throwing up, then he and I may have the same sickness today. That’s what I feel like doing right now. Either that, or choke…just like the Rockets did. Houston was outscored 28-10 down the stretch to a team that has Paul Pierce and a majority of their players with less than 2 years experience in the NBA. Leading up to the Rockets’ fourth quarter collapse, it was probably one of the worst games played this season by two teams in the same game. In the first quarter, the Celtics shot 25% (6-of-24) and the Rockets were 6-of-21. Still, the Rockets led 22-14 after the first quarter. Bonzi Wells scored 10 points thanks to 6-of-7 shooting from the free throw line. In the second quarter, the Rockets opened the lead up to 27-14, and I was thinking, “Okay, this is more like it.” But the Rockets let the Celtics chip into their lead, and by halftime their 13-point lead was down to six, 35-19, even with the Celtics missing 15 of 19 shots, 5-of-6 three pointers, and missing 6 of 12 shots. That’s because the Rockets didn’t shoot much better, missing 12 of 16 shots and missing 3-of-8 free throws. In the third quarter, the shooting still sucked for both teams (Rockets made 35% of their shots and missed 4-of-7 free throws), but at least Houston had a 9 point lead on a hapless Celtics team, and that was without T-Mac in the lineup. I’ll take that kind of lead heading into the fourth. They opened up a 13-point lead with 9 minutes remaining and 12-point lead with 7:30 minutes left on the clock. But that’s when the bottom fell out. The Houston offense stagnated, with Luther Head jacking up threes. It became so predictable, one of his three-pointers was blocked. Then Head dropped a pass on the inbounds play. That was just one of several turnovers Head had (4) since he was handling the ball more with T-Mac out and trying to make too much happen. Rafer Alston and Shane Battier also jacked up some three-pointers in the fourth quarter that missed. Then Juwan Howard took it upon himself to take it to the basket (not a high percentage shot), and was blocked on a controversial no-call. Then Alston threw a bad pass to Bonzi, and the ball was tipped by Boston’s Delonte West for a turnover. Meanwhile, Boston outhustled the Rockets to go on a 10-0 run in 3 ½ minutes to come all the way back and take a 70-68 lead. Then Paul Pierce hit a tough fallaway three-pointer to make it 73-68 with 25.9 seconds remaining. That capped an unbelievable 24-6 run. Houston went to a strategy to foul Boston and hopefully have them miss at the free thow line, but they were stupid in letting their best foul shooter on the floor, Delonte West (84% FT shooting), easily get the inbounds pass, requiring them to foul him and send him to the line. He made all 4 FT attempts down the stretch to seal it. Okay, here’s the really ugly part — Houston’s shooting that contributed to their worst shooting percentage (32%) of the season. Shane Battier: 1-of-12 (shocking!). Alston: 1-of-11. Luther Head: 3-of-11. Three-point shooting: 1-of-22. In my mind, the Rockets missed a lot of those shots in the fourth (0-of-8 from behind the arc) not only because T-Mac wasn’t there to give them better looks. It was also because Boston’s younger legs and frenetic pace wore the Rockets down in the fourth quarter and they didn’t have their legs underneath them. As a team, they shot 32% from the field, their worst for the season, and scored their fewest number of points. They were also out-rebounded 53-48, their fifth consecutive game where they lost the battle on the boards. The only bright spot was Bonzi Wells scoring 27 points on 8-of-16 shooting, but he only made 11-of-16 free throws. The other was Jake Tsakalidas, who grabbed 10 boards and scored 7 points on 3-of-4 shooting. He played pretty well in the second half when the Rockets needed some offense, but having not played very much this season, he tired out in 21 minutes of action. It was a tough loss for Houston since they are trying to keep up with the Spurs to get one of the top 4 playoff seeds in the Western Conference that would give them home court advantage in first round of the playoffs at least. They are now 3.5 games behind San Antonio. Looking at losses to teams like the Hornets, Hawks (Friday night), and now Boston, it will be painful if the Rockets miss getting home court because of lapses to some of the worst teams in the league. Yao goes after a shot of Boston’s Paul Pierce Tuesday night in Houston. Yao was outstanding defensively, causing all kinds of problems for the Celtics. Yao finished with 12 points, grabbed 9 rebounds and had three assists in a 91-73 victory. For more photos from the game, click here. 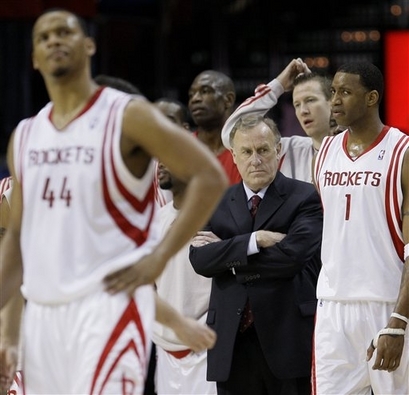 TUESDAY, 12/06/05 – The kind of game the Rockets played on Tuesday night was the kind Rocket fans had been waiting for against a fairly decent team for quite some time. The Rockets finally put together an all-around game with great defense and pretty good offense and beat Boston handily, 91-73. The Rockets held the Celtics to 34% shooting while shooting 45% themselves. After the game, T-Mac said he felt good and like his old self, scoring 35 points and hitting 14-of-20 shots. Combine that with 7 rebounds, 5 assists, and his holding Paul Pierce to 3-of-10 shooting, and you’ve got to think T-Mac is ready to put his recent injury troubles behind him and lead the Rockets out of their 5-12 hole. Anytime the Rockets looked like they were going to hit a scoreless stretch in this game, he would stop the bleeding by hitting a big bucket. Yao played well, too. He scored 12 points on 4-of-9 shots, grabbed 9 boards and had 3 assists. Even though he only recored one block, he had numerous intimidations of Celtic shots down low in the paint and was able to stay out of foul trouble. You are currently browsing the archives for the vs. Boston category.